Sarcasm and the Internet go hand in hand. You certainly can’t have one without the other. 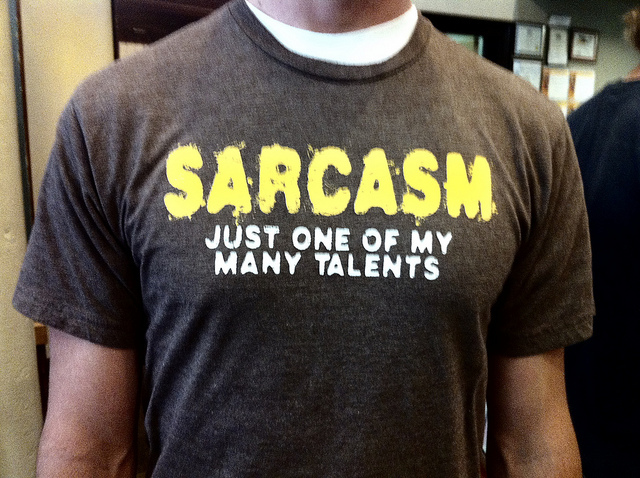 But for so long, we’ve had to express our sarcasm with weird tags and fonts, which made being sarcastic such a chore. For too long e-mails, instant messages, web pages and documents have been unable to fully communicate the subtleties of sarcasm. Text delivered without intonation fail to represent the rare form of language where the intended meaning is the opposite of the written word. Over the internet we yell at each other with ALL CAPS and emphasize with bold and italics, but where is sarcasm? Where is the nuance, the elegance? We say it is time for a change. It’s time for a revolution. It’s time for a new font style! Now, it’s not easy to get the world to adopt a font. Millions would have to install and use it to gain traction, but how many times have you been sarcastic in an email and the recipient just flat out doesn’t get it? Unless you’re writing a long sarcastic rant, it’s most effective to highlight a phrase or two in a sarcastic font than to write an entire note in it. Bold a sarcastic font for really sarcastic comments. A sarcastic font is especially useful when writing to others in a foreign language. They may not understand what you’re saying, but they’ll know it’s sarcastic. Check out the website and install the early versions of the Sarcastic Font. Be sure to tell all of your friends about it too, so they know that you’re being sarcastic. Not about the font though, that’s real. We think.